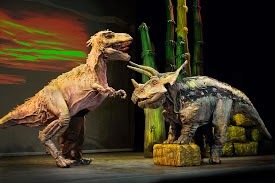 Broadway In Chicago and Erth Visual & Physical, Inc., in association with Red Tail Entertainment, ArKtype and East Bank Entertainment are pleased to announce that Erth’s DINOSAUR ZOO Live™ opens TONIGHT. Created in Australia, the immensely popular international theatre attraction will play the Broadway Playhouse at Water Tower Place (175 E Chestnut) for a limited engagement March 25 – 30, 2014. Erth’s DINOSAUR ZOO Live™ is an experiential theatre production which takes audiences on a prehistoric journey into a new dimension where they get to meet a menagerie of insects, mammals and dinosaurs that once roamed the planet millions of years ago. 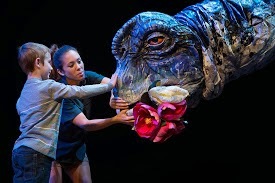 Featuring a large-scale cast of dinosaur puppets brought to life by sophisticated design and theatrical presentation and puppet mastery, these life-like dinosaur recreations connect children to paleontology in a fun and informative setting. 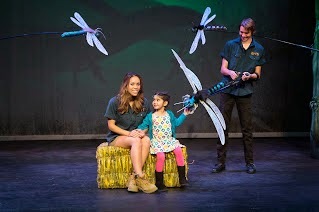 This monster production will feature sixteen dinosaurs on stage: Children can watch and learn, but can also interact with the creatures in this fun, educational and unique presentation. Erth’s DINOSAUR ZOO Live™ is directed by Scott Wright the co-founder of Erth Visual and Physical Inc. and its Artistic Director since inception in 1990. He trained as a dancer and choreographer in Victoria, Australia and is a multi-skilled artist incorporating puppetry (one of his greatest loves), movement, acting, aerial, stilts and pyrotechnics. During this period, Scott steered the company through many twists and turns, creating a successful national and international touring profile. Scott has directed most of Erth’s successful touring shows, and worked with a large variety of national and international companies and institutions, individual artists and community groups. Scott is currently focusing on the survival of indigenous folklore, exploring how ancient stories can be retrieved and presented to new audiences. This exploration takes him to remote communities throughout Australia, to meet with elders, learning and developing methods in which puppetry can tell stories of ancient creatures and landscapes. The dinosaurs and other creature puppets, as well as the flora and fauna that make up the set are designed by Steve Howarth, a founding and fulltime member of Erth. From the Erth studio workshop he supervises a team of artists in the creation of the puppets, sets, props, costumes and associated elements that constantly tour the nation and the globe. In this principle role he has worked with a wide variety of people and organizations, and across numerous media over the past twenty years. The first 15 years were spent performing in, on, and dangling from, many of the creations that he now devotes his full time to building. Now off stage, he oversees the daily production of giant, teeth-gnashing dinosaurs and inflatable monsters that live alongside traditional fine arts and textiles work, and increasingly, he is incorporating new disciplines such as digital animation. Steve recently directed his first work Taniwha! for Auckland Museum in New Zealand, where he worked closely with indigenous storytellers weaving together threads of Maori folklore which was then presented by live actors, puppets, and projection. Steve also mentors design students from several tertiary institutions and assists emerging artists in the implementation of their respective crafts. 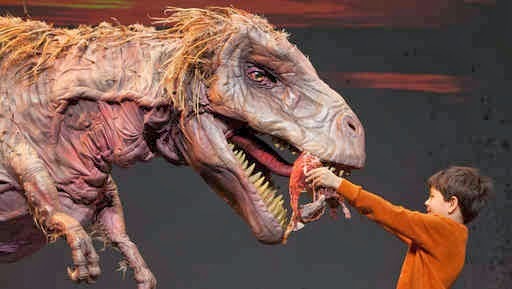 The North American tour of Erth’s DINOSAUR ZOO Live™ is produced by Red Tail Entertainment, ArKtype and East Bank Entertainment. The production team is rounded out by Sharon Kerr, Executive Director at Erth Visual & Physical, and Anna Young, General Manager at Erth Visual & Physical. Erth’s Technical Manager Phil Downing designed the sound, lighting and video. The company of DINOSAUR ZOO Live™ will be lead on stage by ‘Host’ Aimee Louisanne. Kelley Selznick serves as a dinosaur wrangler and puppeteer, Hallie Goodman and Anthony Orefice serve as dinosaur wranglers and puppeteers who also operate the large ‘Hero’ puppets. Jackson Eather serves as the show’s Swing performer. For more information, visit www.BroadwayInChicago.com or www.DinosaurZooLive.us. Friday, March 28 at 10:30 a.m. and 7:00 p.m.
Saturday, March 29 at 10:30 a.m., 1:00 p.m. and 4:30 p.m.
Sunday, March 30 at 1:00 p.m. and 4:30 p.m.
Tickets for Erth’s DINOSAUR ZOO Live™ range from $28-$38. A select number of VIP meet & greet tickets are also available for many performances. Tickets are available now for groups of 10 or more by calling Broadway In Chicago Group Sales at (312) 977-1710. Tickets are available at all Broadway In Chicago Box Offices (24 W. Randolph St., 151 W. Randolph St., 18 W. Monroe St. and 175 E. Chestnut), the Broadway In Chicago Ticket Line at (800) 775-2000, all Ticketmaster retail locations and online at www.BroadwayInChicago.com.